Will Pierce spends his days trying to get the vice president to run in 2016.
camera (Evan Vucci/AP Photo) Vice President Joe Biden speaks at the White House Clean Energy Investment Summit in the South Court Auditorium on the White House campus, June 16, 2015, in Washington. Will Pierce is never far from Vice President Joe Biden. The 27-year-old executive director of Draft Biden 2016, a super PAC dedicated to luring the vice president into the presidential race, is greeted by Biden’s friendly face on a life-sized cutout every morning. It is visible through exterior glass walls in the Chicago office, drawing attention from workers who stop to snap pictures with the cutout. Pierce sits at his desk surrounded by Draft Biden signage and stickers. After working for Hillary Clinton’s presidential campaign in 2008 and volunteering for Obama’s that same year, Pierce held a number of jobs in Congressional and gubernatorial campaigns, mostly doing field organizing. In a recent interview with ABC News, Pierce said he is convinced his efforts to recruit Biden are working. And with a new wave of speculation about a potential Biden run, he may be on to something. Josh Alcorn, an advisor to the late Beau Biden, has even signed on to join Pierce’s super PAC team. ABC: As the co-creator of this group, what’s the specific appeal of Joe Biden? Pierce: There’s a lot of different reasons, but ... Quinnipiac pretty much summed it up in a poll: What is the number one issue that you want out of a presidential candidate? And they [Democrats and Republicans] said trust and honesty. They want to be able to trust whoever is our leader. And they asked all of the different candidates from Trump to Hillary to Biden to Lincoln Chafee, you know, what’s the percentage on trusting or not trusting? And the Vice President polled the best out of all of those candidates. And basically, I just hear time and time again from past supporters of the Vice President who fall back from ’88, even back to the ‘70s when he was a senator, they say his word is his bond. You know he’s real, he’s genuine, and I’ve been hearing this from people who literally had the Vice President sit in their living room. Pierce: One of our endorsers is the state representative from Iowa, Bruce Hunter. Whenever the Vice President runs or thinks about running, they go to Iowa with him and his wife, Bev Hunter. Bev ... literally runs the unions in Iowa, and they basically consider the Vice President a close personal friend. They say when he comes to Iowa, he’s not , like, trying to get something- he just wants to know how their family is doing. He wants to know how their neighbor, who’s 80 years old is doing. ABC: Is this your full time job? ABC: Have you worked for Biden before? Pierce: I’ve been working with Biden on campaigns for 8 to 10 years -- since 2006. Mainly I was with the Vice President 2008 and 2012 as an advance staffer so I traveled mostly with Dr. Biden but I did travel a little bit with the Vice President. ABC: Have you had any direct contact with him since you started the super PAC? Pierce: No, since we’re a super PAC we try to avoid any direct contact. ABC: How big is your staff now? Pierce: We have 10-15 people right now. We have people on the ground in Iowa, New Hampshire, South Carolina. We have about 10 people in our Chicago headquarters, and then right now we have 180,000 supporters across the country. 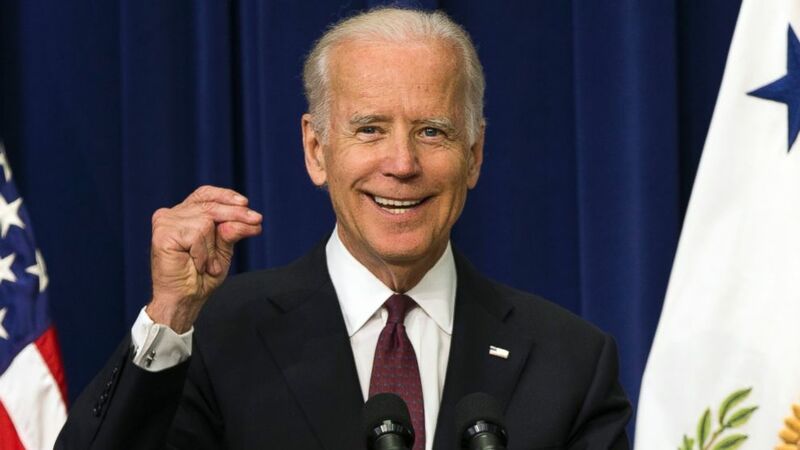 ABC: How late is too late for Biden to enter the race? Pierce: The timeline that we were hearing was that the end of August, early September, is when the Vice President will most likely make a decision. I think that’s going to be the perfect time, just because of the debates as well as everything the Vice President is working on right now. He’s working up on the hill- he’s trying to push the Iran deal through. So, he’s primarily focused on doing his job. That’s why a lot of people like the Vice President. He’s focused on his current job, not his future. ABC: What are the odds he actually runs? Pierce: We haven’t seen any signals saying he’s not going to run. I actually said on MSNBC one time, I called him out and I said, “if you don’t want us to keep doing this, let us know.” We heard nothing from him then, we didn’t hear a no, we didn’t hear a yes, just silence. And that’s beauty to us. But a lot of our supporters, we’re just waiting for whatever he decides. We know he’s not just going to sit there and leave it as an open-ended answer. ABC: Are you raising money? Pierce: Last quarter, we raised $80,000 to $90,000. John Cooper, who was a major bundler for the President in 2008, he signed on to support us. We also had Shiva Sarram, who raised the most for President Obama in one event: she raised about half a million dollars in one night; she came on. And then Dr. Howie Mandel -- not the actor -- he came on to support us and he’s going to be doing a major event for us up in LA. ABC: Have you talked to supporters of the other Democratic candidates who have said that they would transfer their support if Biden ran? ABC: How do you think the death Beau Biden will affect the vice president’s decision whether to run or not? Pierce: I actually knew Beau. When news came out in May about Beau’s passing, we were very supportive. A lot of our supporters actually knew Beau. One thing that is really key--a Wall Street Journal article came out and said that Beau actually wanted the Vice President to run. And one thing about the Vice President, he’s resilient. And when he was elected to the United States Senate, his wife and daughter were tragically killed in a car crash. And a lot of people thought he wasn’t going to serve in the Senate because of that. But instead, he Amtrak’ed back and forth to Delaware to be with his sons, Hunter and Beau. What a lot of people are saying, and speculating, is that he can use that as motivation-Beau wanted him to run… personally, I do see him using that to motivate him. There’s been a lot of momentum. We’re urging our supporters to sign the petition- just when and if the Vice President runs, he has an army ready to go behind him.